Applications are now being accepted for a special license plate to help raise funds for Trooper Island, a free summer camp for disadvantaged boys and girls age 10-12 operated by the Kentucky State Police on Dale Hollow Lake in Clinton Co. In order for the Transportation Cabinet to make this an official tag for vehicle registration in Kentucky, 900 applications must be received by September 2009. The cost is $28.00 at the time of application with an additional $16.00 due at the time of pick up. Applications can be obtained from any state police post or downloaded from the KSP web site at www.kentuckystatepolice.org . Trooper Island is financed entirely by donations, no public funds are used. Each year, the camp hosts approximately 700 children, providing good food, fresh air, recreation, guidance and structured, esteem-building activities designed to build good citizenship and positive relationships with law enforcement officers. For more information, visit the KSP web site at www.kentuckystatepolice.org or call the KSP Media Relations Branch at 502-695-6344. A bill that would allow the Kentucky Transportation Cabinet to replace the state’s license plate whenever it sees fit was approved by the House Transportation Committee this week. Currently law stipulates that the state’s license plates be replaced every five years. Since the current license plates featuring a smiling sun were introduced in 2003, they are currently scheduled for replacement in 2008. Kentucky’s “Mr. Smiley” license plate, which has been the object of much derision since its introduction last year, has received the 2003 Best License Plate Award from the Automobile License Plate Collectors Association. The bill is Senate Bill 57 . The state senate has approved a “Choose Life” special licence plate; however, it rejected an amendment to create a “Protect Choice” license plate. Breast cancer awareness and Kentucky Colonels license plates were also approved. The bill must be approved the state house of representatives. Gov. Patton has defended the design of the new license plates by saying, "they don't put Rembrandts on the backs of cars." He also said that he personally had nothing to do with the design of the license plates, but that he does like it. The design of Kentucky's new license plate has been revealed. The new plates will begin being distributed in January. 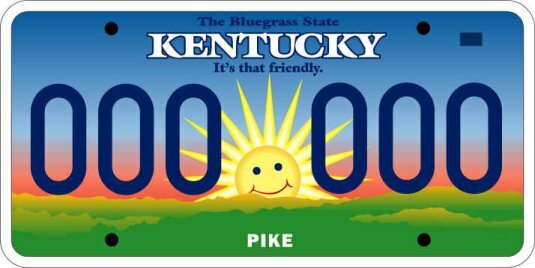 By state law, Kentucky releases new license plates every five years.